Directed by Joseph L Mankiewicz (Dragonwyck, All About Eve, Cleopatra) from the play by Tennessee Williams (A Streetcar Named Desire, Cat on a Hot Tin Roof) and brilliantly adapted for the screen by Gore Vidal (Ben-Hur, Myra Breckinridge), Suddenly, Last Summer casts three of Hollywood’s most iconic talents (Elizabeth Taylor, Katharine Hepburn, Montgomery Clift) in a daring and often delirious mix of lurid drama and Gothic horror. 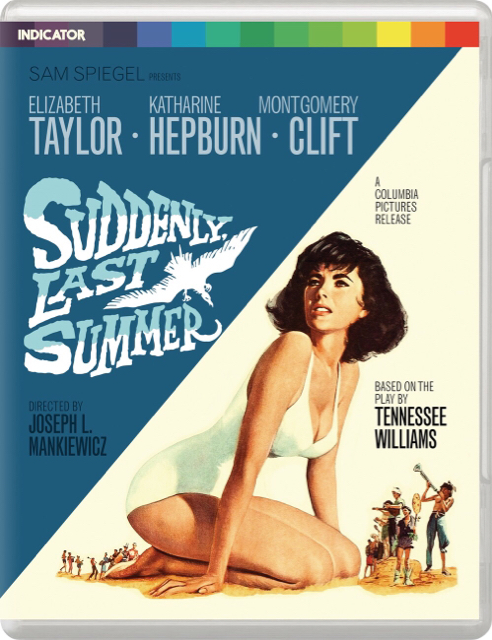 Sensational and wildly controversial at the time of its release, Suddenly, Last Summer now stands as a classic – and stills packs a provocative punch. So how does this one compare to the other Williams plays that Taylor and Hepburn performed? This is honestly one of my favorite Manks because of how well he understands the craziness the material needs to survive. There's a fine film of the play SUDDENLY LAST SUMMER, made for television I believe, with Maggie Smith as Mrs. Venable and Natasha Richardson as Catharine. Very well done, even with Rob Lowe as the doctor. Watching Maggie Smith work her wiles on Rob Lowe is more than worth the effort it'll take to seek it out -- you haven't quite lived until you've experienced Maggie Smith turning those bedroom eyes on Rob Lowe and purring out the words, "Dr. Sugah..."
The late career Taylor/Roeg TV production of SWEET BIRD OF YOUTH is a fab watch too; the material is easy fodder for Taylor - drink in hand - playing it at eleven and Roeg who can still direct a masterclass on any budget. It also makes the smart choice of having main attraction Taylor on screen for all but five minutes of the movie. This new Indicator release is another in the label's consistently excellent releases, showing first-rate technical quality and a dedication to extra features rarely seen elsewhere. I saw that and just don't get it. Just print out a new cover or something if it's that important. Plus, it's not even like the Indicator cover is bad. It's just the poster. I get not wanting to import, but to willingly choose to get a barebones disc because of a picture? Yikes. I know some French people who dont buy anything that isnt in a regular plastic case, so they're currently importing the BFI Belle et la bête, despite the French release being out for years and not having to deal with the replacement programme, while simultaneously hoping the replacement will be maybe even better than the French disc. Some people are just crazy and their priorities too. EDIT : the full story is even better. When La belle et la bête was released in France some years ago by M6, it was in a fancy cardboard packaging with a booklet. Because it wasn't a plastic case and that the packaging is slightly higher than your regular Blu-ray case, these persons ranted about it and chose not to buy it. Now, a regular plastic-case release exists but it doesn't have the booklet, so they don't want to buy it either. They thus waited for the BFI release, only to find about the compression issues, and are now hoping that once fixed, it will be better than the French disc... which was already very good in this regard.